They are all highlighted at the 70th American Association for Clinical Chemistry (AACC) Annual Scientific Meeting and Clinical Laboratory Expo (CLE), being held July 29 - August 2, 2018 in Chicago. Beckman Coulter Life Sciences, part of the Danaher Corporation, is exhibiting on booth #3612 alongside Beckman Coulter Diagnostics (another Danaher company). ClearLLab CaseBook 5C, a step by step illustrative resource into complex pattern recognition for leukemia and certain lymphomas, using the ClearLLab panel of reagents. These are the first preformulated, IVD antibody cocktails for L and L immunophenotyping in the clinical lab. Enhanced portfolio of single color CE-IVD and analyte-specific reagents (ASR); all manufactured under Good Manufacturing Practices. DURA Innovations dry reagent technology, available in a range of services and reagents including ClearLLab. Expanded external business resources - the LUCID custom design and cocktailing services and RESOURCE contract manufacturing services, both of which are underpinned by DURA Innovations. To aid in this complex pattern recognition, the company has developed a unique educational resource, the ClearLLab CaseBook. Users can also download the data to continue their diagnostic practice. 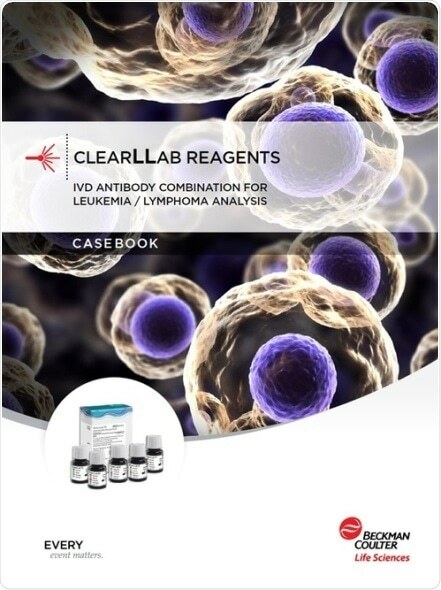 The casebook is based on the ClearLLab 5C reagents which were the first preformulated, IVD antibody cocktails for leukemia and lymphoma immunophenotyping to be granted de novo authorization by the Food and Drug Administration (FDA) for in vitro diagnostic use. ClearLLab reagents simplify and standardize the process. The ClearLLab 5C Casebook provides the clinical history of 16 patients, illustrating the progressive analysis of flow cytometric immunophenotyping data by means of numerous color-coded illustrated scatter plots. These first assess and then assign the cells before giving a detailed characterization of the aberrant population according to the presence or absence of antigens. It includes patients with characteristic findings typical of various lymphoid and myeloid neoplasms as well as those with clinical and/or laboratory findings suggesting an underlying neoplastic process, but in which no immunophenotypic abnormality is identified. Specimen types include peripheral blood, bone marrow, and lymph nodes. Each case concludes with an assessment of the immunophenotypic findings as well as potential pitfalls. Beckman Coulter now offers the largest portfolio of single color CE-IVD and ASR conjugated antibodies. The company manufactures all its single color reagents under Good Manufacturing Practices (GMP) in facilities that adhere to the highest standards in the industry. Their tandem dye stability and lot-to-lot consistency ensure reproducible and reliable results. The DURA Innovations dry, unitized reagent assays help the lab simplify sample preparation, by reducing preparation time and reagent waste. The company’s panel design experts created its range of multicolor pre-formulated options to standardize flow cytometry workflows, whether used for clinical research or research studies.The panels include single color compensation tubes for enhanced accuracy in off the shelf products and LUCID solutions. Further, these solutions are at the heart of the company’s expanded external business resources, delivering off-the-shelf reagents, customized solutions through ​LUCID custom design and cocktailing services (CDS), or in bulk through RESOURCE contract manufacturing services (CMS).